How Do Ventless Gas Heaters Work? Ventless gas heaters are room-heating furnaces that do not vent air to the outside of the house. Instead, the oxygen that is needed to fuel the combustion process for heat is taken from the air inside of the room in which the unit is placed, and the resulting heat is vented back out directly from the unit. Because there is no outside air exchange -- which is the reason most traditional heaters lose the majority of their heat -- ventless heaters are much more efficient than traditional heating systems, however, there are some drawbacks and limitations to be aware of. 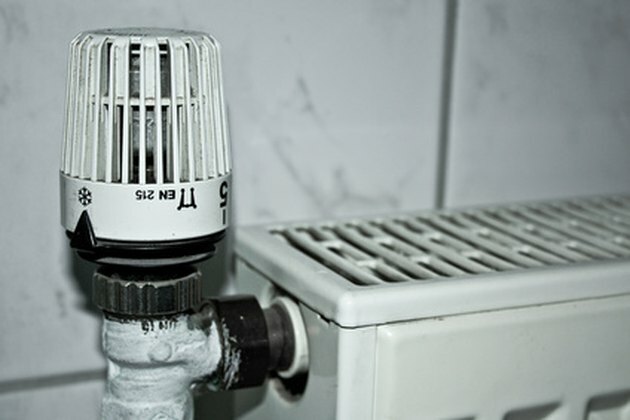 What is a Ventless Gas Heater? Because all combustion heaters require oxygen for their burning process, traditional heaters draw on the unlimited supply of outside air to sustain combustion. In addition, there are many types of combustion heaters such as pellet stoves and wood-burning stoves that do not completely burn away the fuel source. The result is that smoke is released into the air as the burning process takes place; this must be vented back into the outside air where it can dissipate, but the drawback is that much of the heat is vented as well. Lastly, burning any substance nearly always results in the emission of carbon monoxide, which is known to be poisonous to humans and animals, and can result in death if it is released into an unventilated room. Although gas heaters burn much more efficiently than wood- or pellet-burning units, the resulting carbon monoxide has always called for an outside air vent to be installed to safely operate the unit. Ventless gas heaters, however, do not use such a vent; instead, they simply vent the heated combustion exhaust directly into the room in which they are placed, and provide a much more effective heat source as a result. Because ventless gas heaters are not connected to the outside air, they are one of the most efficient appliances for heating rooms in a house; on average, ventless heaters operate at around 99.9 percent efficiency. In addition, natural gas and propane are one of the cleanest burning heating options available, producing much lower harmful emissions because they burn nearly all of their fuel sources consistently. The dangers of using ventless gas heaters are many and controversial, which is why some states, such as California and Massachusetts, do not allow ventless gas heaters to be used. Some of these dangers include asphyxiation, as the air inside of a well sealed house is depleted of oxygen, and carbon monoxide poisoning, as the minute amounts of carbon monoxide can also build up over time in a well sealed house, attaining levels that are dangerous and can be deadly. Although these dangers should be taken seriously, it should also be noted that open fireplaces emit even higher levels of these substances. Lastly, ventless gas heaters create water vapor as a part of their exhaust, which raises the humidity in a room or house and can result in mold or mildew growing on all the surfaces therein. Kevin Freeman has been writing for over 21 years, during which he has been featured in print and online publications including "Careers in Gear," the "Winding Way Bulletin," Kindle Books, Auto Sales and Marketing Newsletters, and many more. After attending the University of Phoenix, Freeman enjoys writing of all kinds. Why Does My Gas Fireplace Smell Like Kerosene? Can I Convert a Wood Fireplace to a Gas Fireplace?